People – Faculty, staff, graduate students. Research – Journal articles, thesis. Choose the right tree, shrub or woody vine based on your site’s conditions. More UHI videos and webinars. 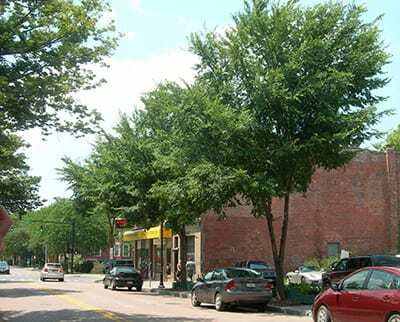 Recommended Urban Trees – Access through Woody Plants Database. Print on demand. CU-Structural Soil® – A Comprehensive Guide – 56 page publication covers the why’s and how’s of using CU-Structural Soil® to support trees, turf and porous pavement. Tree ID Guide – Illustrated, 76- page guide for people with little experience. Order form. The State of the Elms on the National Mall in Washington, D.C.: Tree and Soil Conditions – UHI study conducted at the request of the National Park Service to examine the current conditions of the historic trees and soils on the National Mall. View final report and recommendations in The State of the Elms on the National Mall in Washington, D.C.: Operations and Maintenance Guide. Routledge Handbook of Urban Forestry – Features two chapters by Nina Bassuk, Site assessment: the key to sustainable urban landscape establishment and Design options to integrate urban tree root zones and pavement support within a shared soil volume. Know Your Trees – Update of classic includes identification keys, descriptions of 50 common native trees. Also available in as 7.2 MB .pdf file. The Sustainable Landscapes Trail – Highlights the sustainable design and ecosystems services of green infrastructure across the Cornell campus. Features bioswales, CUSoil plantings, open spaces, natural areas, and more. ‘Urban Eden’ plant walks – Topical walks on campus for students in Creating the Urban Eden: Woody Plant Selection, Design, and Landscape Establishment (PLHRT/LA 4910/4920). Stewart Park Tree Tour– Use your mobile device to access information via QR codes for 22 trees in this City of Ithaca park on the south shore of Cayuga Lake. New paper: Creating urban tree biodiversity within a uniform street tree landscape. The selection, evaluation and propagation of superior plants with improved tolerance of biotic and abiotic stresses, and enhanced functional uses in the disturbed landscape. Developing improved technologies for assessing and ameliorating site limitations to improve plant growth and development. Developing improved transplant technologies to insure the successful establishment of plants in the urban environment. Working with municipalities to assess and manage their urban tree resources while applying appropriate technologies.